vibrant nightlife and business centers intersect with magical colonial architecture and cobbled streets of the Barrio La Candelaria. Also famous for its inexhaustible cultural, impresses with its many instances of artistic expression, which lists dozens of museums, art galleries, cultural centers and massive free outdoor festivals. More information in the following article in Bogotá. Magical city built on the shores of the Caribbean Sea, surrounded by imposing walls and fortifications that once protected it from attacks by pirates and privateers. Declared today a World Heritage Site by Unesco, wonder about the preservation of its colonial identity, with cobbled streets where time seems to be no, between squares after one more beautiful than another and colorful architectures from which delicate balconies overlook wood . Urban beaches scattered in the tourist resort of Bocagrande or immersed among coral natural sanctuaries of Rosario and San Bernardo islands, eventually enrich the attractions, which is undoubtedly one of the most important tourist sites in Colombia. More information in the following article in Cartagena de Indias. 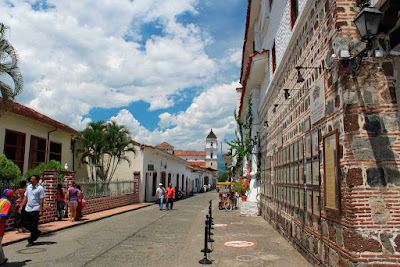 Among the beautiful landscapes of the Sierra Nevada mountains and the Caribbean Sea, it is located which is considered the oldest city in Colombia and the second in South America enclave of history that shines for its colonial architecture recently restored through the most ambitious restoration project assets that have made the country. Ecotourism between national parks and beach tourism in its twenty-seven bays of white sand and clear water, are also among its attractions, highlighting the mega-diverse Tayrona National Park, home to mangrove forests, seagrass beds and coral reefs, among which are some of the most beautiful beaches in the country. More information in the following article from Santa Marta. Without being one of the most popular tourist sites in Colombia, it is home to some of the most beautiful colonial architecture in the country. Declared National Monument, fascinated by the look of city frozen in time, still retaining its cobblestone streets lined by old houses, from which windows and balconies decorated with delicate wood balustrades overlook. Bridge West, built in 1895, is another of its sites, considered a work of amazing engineering for the time, impresses with its 291 meters in length, crossing the Rio Cauca, communicating Santa Fe with the neighboring city of Olaya . Considered one of the most beautiful villages of Colombia, captivates with its preserved colonial architecture, surrounded of valleys and agricultural landscapes, which have as a backdrop the majesty of the Andes. With Andalusian villages like appearance, known for its white buildings, totally cobbled streets and a monumental main square, vast expanse of 14,000 square meters, considered the largest in Colombia. Route 6- or Coffee Triangle: Caldas, Quindio and Risaralda. Region situated between coffee plantations, characteristic for its snow-capped peaks, green hills and mountain landscapes agricultural valleys of the Andes, including burst magical colonial towns and country estates living around coffee production. The whole route passing through the departments of Caldas, Quindio and Risaralda, building a geometric triangle, has been declared a World Heritage Site by Unesco, hosting today a wide range of rural tourism on experience the culture of coffee. The park today declared a World Heritage Site by UNESCO, spans 2085 km2, organized in the archaeological areas of Alto del Aguacate, the Alto de San Andrés, the Alto de Segovia, the Alto del Duende and the Board. 8- San Andrés and Providencia.Archipelago located in the Caribbean, in the paradisiacal environments of the Sea of ​​Seven Colors, natural wonder of water varying tonalities between between intense blue, light blue, turquoise and green. Recognized as a Biosphere Reserve by UNESCO, captivates with its unique landscapes, including mangrove forests, palm trees, coral reefs and seagrass surrounding white beaches, considered among the most beautiful in America. San Andrés, its capital and largest island, is the one that has the largest tourism infrastructure, and from which excursions to the extraordinary marine biodiversity surrounding cays and islands of Providencia and Santa Catalina are undertaken. Nature sanctuary declared a World Heritage Site by UNESCO, considered one of the tourist places of Colombia where the diversity of flora and fauna is more abundant. Ecosystems ranging from coral reefs and tropical rain forest, build the breathtaking landscapes of the island, among which is possible to see dolphins, sharks, sea lions and the amazing migration of humpback whales approaching the coast from July to November to giving birth. White sand beaches immersed between uninhabited landscapes are other of its attractions, ideal for practicing snorkeling and diving, diving among the most diverse coral bank in the Eastern Tropical Pacific locations. Gateway to the extraordinary beauty of the Amazon rainforest, a multicultural city that technically form one with Brazilian town of Tabatinga, home to many indigenous communities that manage most tourist services. From the city you can embark on the Amazon River, going into the dense tropical jungle, fascinating journey that crosses the most mega diverse region in the world. fascinating stops on this tour are the Amacayacu National Park, with its giant water plants reaching up to two meters in diameter or Tarapoto Lake, home of the unique freshwater pink dolphins.